Your son has been toddling along for about a year or so now, and you’ll have noticed his physical and mental attributes developing at a startling pace. In regard to motor skills, he should have greater balance and should be able to climb stairs easily. This may spur on the little explorer in him as well. You’ll also notice that his language and listening skills have developed quite a lot. Your son can take instructions and tell stories, so consider any toys that spark his imagination. Furthermore, his social skills have developed to the point where he can share and he has started showing genuine compassion for his friends. I’ve chatted with a few parents, which has given me an idea of which toys worked out best for their little boys. The following 20 toys will engage your son, developing his mental, physical, and social skills in the process. Any boys who enjoy Nickelodeon’s Paw Patrol show will gravitate towards this toy. The main boat features a set of wheels on the bottom, which you can pull down and place on a solid surface whenever your son wants to play with it. 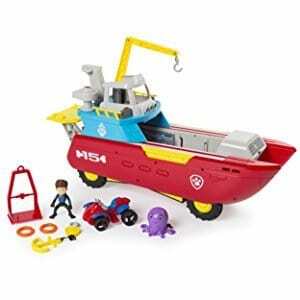 It also comes with some little plastic accessories, including an octopus toy, vehicle, Ryder figure, and some life preservers. The boat also has a launching mechanism that fires the life rings out to “sea”. There are also a few sounds and some flashing lights to add to the “rescue” situation. 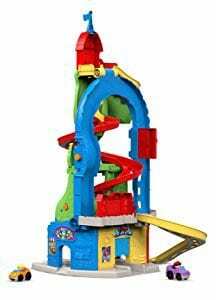 What's Great About It: The toy combines a popular kids’ show with plenty of interactive elements. I like how it transforms into a land vehicle and that you could use it to teach basic water safety. 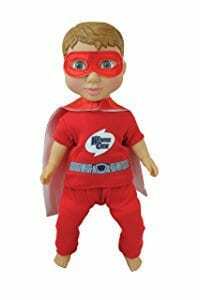 The desire to imitate others is a key developmental step for toddlers, and this superhero doll offers just that. It comes with a Wonder Crew-branded cape and mask that mimics what the doll wears, so your son can team up with the doll to go on adventures. The doll itself has a sturdy vinyl head, which makes it resistant to crushing and throwing. The rest of the doll has a soft packing, which makes it a great nighttime sleeping toy for restless boys. It’s 15 inches tall too, so there’s plenty for your son to grab onto. What's Great About It: I like the dressing up aspect of the toy, as it helps your son form a bond with the doll that holds his interest. It’s also a great soft toy for cuddling during bedtime and car rides. As your son’s motor skills develop, he’s going to enjoy pulling at things and trying to put them back. 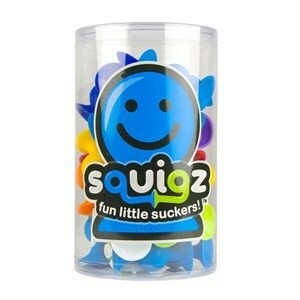 The Squigz starter set caters for that, as it contains 24 pieces, each with their own suction cups. Your son can put them together and stick his creations onto the wall, window, or table. I particularly like that this toy inspires creativity, as your son can put the pieces together however he wants. It also comes with a plastic storage cylinder, making the silicon pieces easy to pack away after use. What's Great About It: This toy is all about creativity, as your son can build whatever he can think of with the pieces. It has strong suction cups too, so you can also use them for bath time play. Any boys with an interest in cars will like this toy. 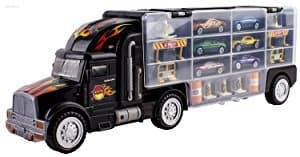 In addition to being a large car toy in its own right, it contains enough slots for your son to store 28 other small car toys inside. As a result, it doubles as both a toy and a storage solution. The set comes with six smaller cars to get you started, plus a set of cones and construction signs, which also fit into the storage compartments. Your son can create his own roadside scenes using the accessories. What's Great About It: This clever toy lets your son take his little cars with him wherever he goes, while offering you a nifty storage solution. The accessories let your son explore his creative side, and the truck even has a handle. Your son’s probably watched you mow the lawn before, and this toy lets him imitate you without the dangers of chopping blades. 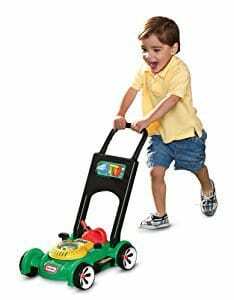 The top of the mower carries a see-through compartment that contains beads that bounce as your son pushes it. However, the little touches are my favorite thing about this toy. There’s a small key, which turns to “start” the mower, and a cord that makes an engine sound when pulled. As well as being fun, these features develop your son’s basic motor skills. What's Great About It: The interactive elements mimic real-life lawnmowers well. I was particularly impressed with how Little Tikes uses the pull cord and key to help your son’s developing motor skills. You may feel wary about introducing your three-year old to pogoing, but I think it’s good for developing balance and muscle strength. 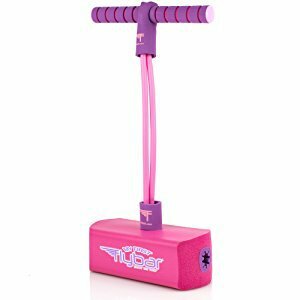 Flybar ensures your son’s safety with a bulky foam base and strong foam grips on the handle. You won’t have to worry about the stick slipping from under your son’s feet. The jumper squeaks with each bounce, which you can use to develop your son’s math skills. Have him count upwards with each squeak to create a challenge that also familiarizes him with numbers. What's Great About It: The jumper offers a safe way to challenge your son’s developing motor skills, balance, and coordination. It can carry a lot of weight, and the use of foam makes it safer than traditional pogo sticks. This set comes with 130 wooden pieces. You receive 100 track pieces, which you can assemble into four configurations, alongside 30 other accessories. These include three trains, which range in size from three pieces to six, and several decorations, including trees and signs. I like the packaged instructions, which show you how to build each track configuration. Your son will enjoy a sense of achievement when he follows them correctly; with the accessories allow him to get creative. There’s also a crane piece with a small magnet that can pick up the little freight containers. 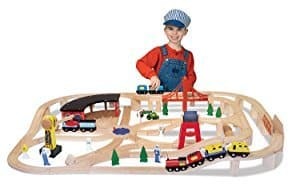 What's Great About It: The sturdy wooden track pieces ensure the longevity of the set and they slot together snugly. 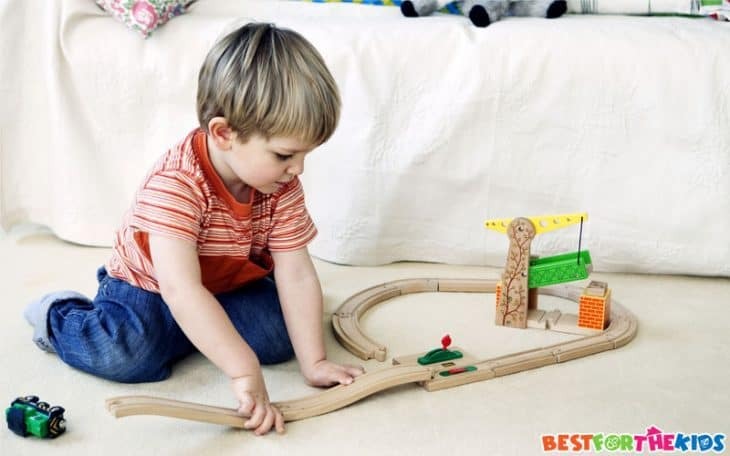 I also like how your son can build several tracks, and the rewarding element of being able to play with it after building. Getting your son involved in STEM learning early will give him a head start in science and math subjects when he starts school. This set features 101 large pieces, which your son can use to create little vehicles and other objects. While the set encourages creativity, I was a little concerned that it may be beyond the grasp of a three-year-old. However, it comes with an eBook that contains instructions for building 12 models. This presents the opportunity for cooperative play with your child, allowing them to build something they recognize so they stay engaged. What's Great About It: Any toy that uses certified non-toxic pieces gets plus points from me, and I like how it offers an early start with STEM education. The eBook is a smart touch, as it keeps your son engaged with the set. There’s no getting away from the fact that your child will start using mobile devices at an early age. This tablet introduces your son to the basic concepts of tablet computers, while offering plenty of learning opportunities. The small screen hosts 12 activities, each of which introduces your son to basic concepts in numeracy, language, and other subjects. 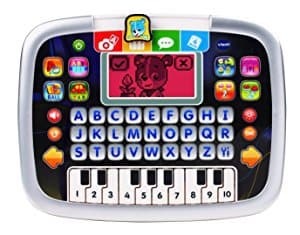 There’s also a piano, and a full keyboard that you can use to teach the alphabet to your son. What's Great About It: The toy introduces your son to tablet computers and several important early learning topics. He’ll also learn basic typing skills, and he can use the piano to create small musical compositions. 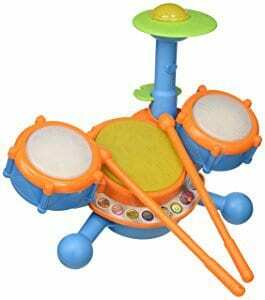 This drum kit features three plastic drums and a cymbal, which each plays their own sounds when struck with the included plastic drumsticks. There are also four play modes, which have educational features to them. The play modes include following along with letters, numbers, and one of the nine songs that the set plays. There’s also a free-play mode for when your son wants to get creative. What's Great About It: The set takes your son’s penchant for hitting things and turns it into a learning opportunity. 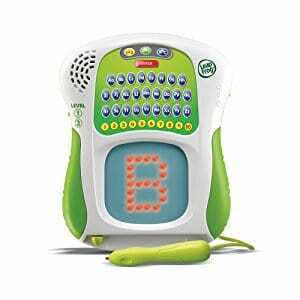 The four play modes keep him engaged and teach him about basic letters, numbers, and musical compositions. The PlasmaCar keeps things simple, requiring no pedals or batteries to get it moving. Instead, it’s all about your son’s legs. He’ll develop his leg muscles as he rides, with the steering wheel also allowing him to develop his upper body and arm strength. It has a comfortable seat with a small backrest, and two foot pads for use when your son gets the car rolling. It also has several safety certifications, including meeting the ISO, ASTM, and CCPSA standards. 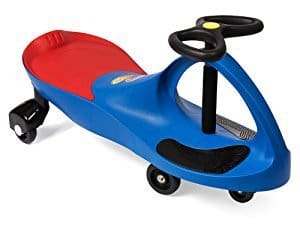 What's Great About It: There’s practically no learning curve with this toy, as your son can just hop on and get moving. I appreciate any toy manufacturers that make the effort to obtain safety certification, plus it’s great for developing muscles. 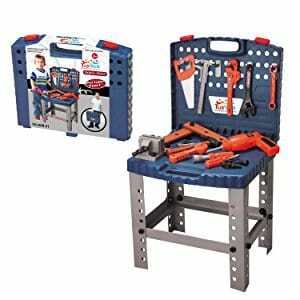 Another toy that offers your son the opportunity to copy what he sees; this workbench impresses with its sheer range of accessories. It comes with 12 tools, including a hammer, saw, and drill. There are also plenty of nuts, bolts, and other accessories for a total of 64 parts. I’m a fan of portability in kid’s toys, so I like how the workbench folds up into a carry case. You can pack all of the tools inside and take it wherever you go, or store it for later use. What's Great About It: You get a lot of accessories in the package, and the workbench is a perfect height for most toddlers. It also folds into a carry case in which you can store the assorted tools and bolts. An impressive sight when you’ve got it assembled, the Skyway includes a bending road that your son will enjoy driving cars down. Most impressive of all is the fact that it converts from a seated skyway into a standing one. This offers more variety, and means your son can carry on playing even if his legs get tired. The toy comes with a couple of Fisher-Price vehicles, and you can buy vehicles separately to add to it. There’s also a switch, which your son can flip to send the car down a different road. All told, the tower has three exits at the bottom, with one leading to a small jump. What's Great About It: The multiple routes, which your son activates with a switch, teach him about cause and effect. The fact that it converts offers variety and longevity. 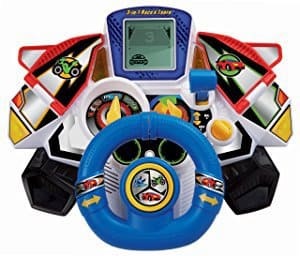 This may be the perfect toy for little car enthusiasts, as it features a steering wheel and several dashboard accessories. These include a lever and twisty knob, which your son can use to simulate starting a vehicle and changing gears. The toy also teaches basic math and language skills, in addition to having a vibrating wheel to improve immersion. It also has three settings: jet, motorcycle, and car. Your son can switch between them at will, and the small screen above the wheel displays race courses that correspond with the vehicle selection. There are nine courses in total. It does need three AAA batteries, and the ones that come with it don’t last very long. However, it has an auto-shutoff feature that preserves battery life. I also like the volume controls, which allow your son to play without disturbing others. What's Great About It: The Race and Learn lets your son simulate the driving that he’s likely seen you do in the past. I like the variation between the courses and how you can switch between vehicles. It’s also a good teaching tool. 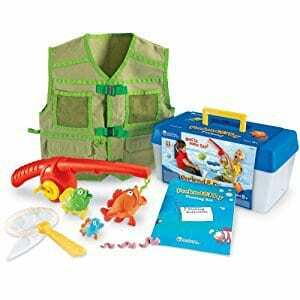 This set comes with 11 pieces, which include a rod, fishing jacket, and three fish for your son to catch. You also get a net and three pieces of bait, in addition to a carry case for the set. This set imitates the style of a bait box for added authenticity. The rod’s line has a small magnet at the end, which latches onto a small metal patch on each fish to catch them. I like how you can use the set to teach basic math skills, showing your son how to count to three. ​The set improves motor skills, but it also lets your son exercise his imagination and copy you if you’re an angler. I should note that right-handed children will find the rod easier to use than left-handed kids. What's Great About It: Apart from developing motor skills and coordination, this toy lets your son’s imagination run riot. There’s also a dedication to authenticity and realism thanks to the jacket and bait box/carry case. Another great toy for STEM education, this building set comes with 56 pieces, which split into 24 triangles and 32 squares. 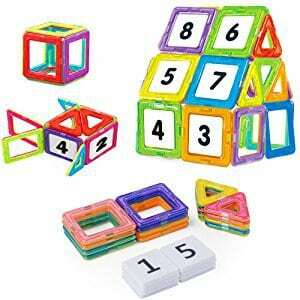 Each is magnetic, so your son can slot them together to create any structures that come to mind. They’re equally adept at handling 3D structures as they are flat shapes. The set develops your son’s fine motor skills, and Idoot uses non-toxic plastics throughout. I also like the rounded corners and smooth edges, which ensure that your little one doesn’t suffer any unfortunate cuts. 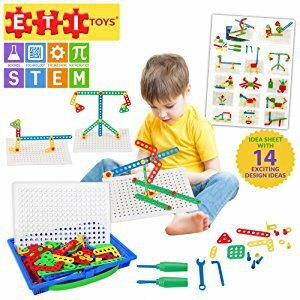 What's Great About It: A great early STEM educational tool, this set features enough pieces to build all sorts of objects. I like the use of non-toxic plastics, and the storage bag lowers the possibility of losing the pieces. T-Ball is a great way to develop your son’s interest in baseball, alongside his coordination and balance, before he’s ready for the real thing. 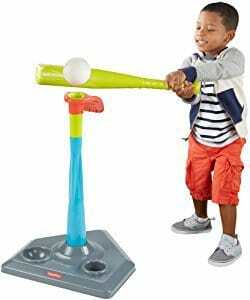 This set comes with a plastic ball and bat, plus the stand doubles as a storage unit when it’s not in use. The stand adjusts in height as your child grows, so he’ll play with it for several years. The low weight of the bat and ball impressed me too, as this lowers the risk of the ball causing damage. The set also comes with an instructional booklet that demonstrates proper batting technique. What's Great About It: T-Ball develops your son’s physical attributes and enhances his balance and coordination. The instructional booklet is a nice touch, and I like how the base doubles as a storage unit. This toy provides a range of creative opportunities for your son, combining chalk and marker drawing with magnetic pieces. The two-way board features a blackboard and a whiteboard, and the set contains an eraser for the former. The marker pen for the whiteboard rubs away when wiped with a cloth. 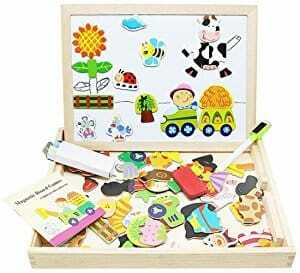 The set comes with 100 magnetic pieces, which your son can stick to the whiteboard however he wants. They also stick to the fridge door if you want a bigger play surface. When playtime finishes, just pop the board over the top of the set to keep everything contained within. ​It also comes with ASTM certification, plus you get three pieces of chalk for the blackboard. Unfortunately, the whiteboard doesn’t lock onto the top of the box, so be careful when carrying it around. What's Great About It: This may be a great toy for inspiring your son’s creative side, as it gets him drawing and making strange creatures with the magnets. It packs away into a self-contained box too. This may be one of the better toys for teaching your son to write and count. It displays big letters and numbers on the center screen, which your son traces using a stylus pen. There’s a cord that attaches this pen to the pad. The pad runs through the entire alphabet, and counts from one to 10. I really like the feedback system too, as it tidies up your son’s handwriting while helping him develop his fine motor skills. There’s a small speaker in the top-left corner that describes each letter and number’s sound as your son writes. What's Great About It: I like how the toy teaches basic counting and letters, while incorporating a challenge for your son to overcome. There’s no risk of losing the stylus pen, and it develops your son’s motor skills. This two-wheel bike offers a nice middle-ground between trikes and real bicycles. There aren’t any pedals, so your son uses his feet to propel himself along. This isn’t a bad thing, as three-year-olds may not have the balance required to use pedals and stay stable on a two-wheel bike. The adjustable saddle drops to a minimum height of 12.2 inches, so it’s okay for smaller toddlers. The use of foam for the tires impressed me, as this means you don’t have to inflate them or worry about punctures. What's Great About It: The bike serves as a good training tool for the real thing, and it’s quite sturdy. The saddle adjusts and the handlebars are easily graspable for small hands. Since he started walking at approximately two years old, your son’s balance and coordination will have improved. As a result, he may lose interest in any toys that don’t challenge his newfound mobility. He’s also developing into an independent person with his own interests and desires. Your three-year-old may not instantly enjoy every toy you put in front of him anymore, so you have to consider his interests. For example, if he latches onto car toys, use that as the basis for your search for new toys. Your three-year old watches everything that you do, so any toys that let him play along with you go over well. He’ll also like having plenty of accessories to explore, so don’t be afraid of buying an entire pretend tool set, or something similar. In fact, such toys offer greater longevity. As your son develops his mental skills, he’ll want to figure out how things work. Stacking toys aren’t complex enough for him anymore, so you can move on to toys that require some more building. With greater balance and coordination comes a desire to test his skills. Your son may latch onto any toys that present a physical challenge, though you must stay aware of age restrictions. Pushing your son too far physically could cause injury. 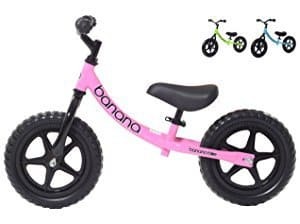 Sports-based toys help him develop basic motor skills, while trikes and balance bikes aid with his balance. Remember that the Centers for Disease Control and Prevention (CDC) recommend that your son engages in an hour of age-appropriate exercise and physical play every day. Your three-year-old isn’t far away from starting school, so consider any toys that offer an educational jumpstart. I find that toys which focus on the alphabet and basic counting are age-appropriate. You may find that some toys mix education in with other aspects of play, such as keeping score with your son. While your three-year old may still struggle to grasp the concept of team play, he should now have more empathy for other children. You can teach him about sharing, and he’ll understand what belongs to him and what belongs to others. You may want to encourage group play with the toys on this list. However, be aware that your son may experience some wobbles along the way, especially if somebody’s playing with a toy that he wants. I hope that my list serves as a launching pad for you to find a great toy for your three-year-old son. All 20 of these toys may make a great choice.